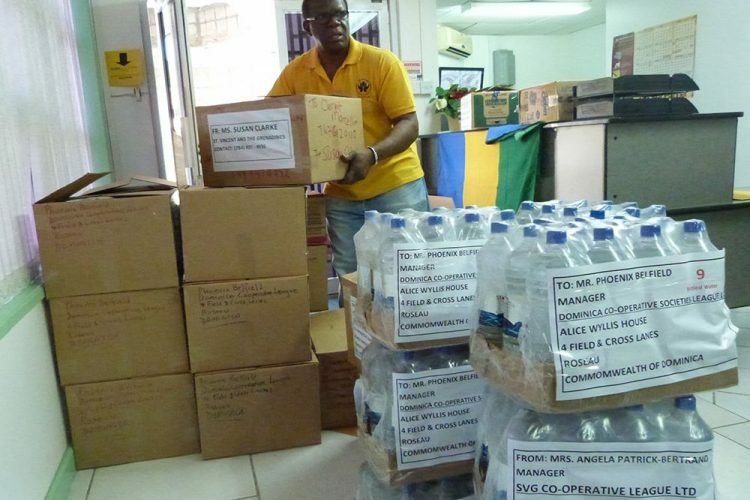 Ten thousand dollars worth of supplies were shipped by the St Vincent and the Grenadines Co-operative Credit Union League (The League) to Dominica earlier this month to assist with the ongoing need for support on that Island. The League, which is the umbrella organization for all the credit unions in St Vincent and the Grenadines (SVG), had spent the month of October, which is credit union month, raising money and collecting supplies, which were shipped to Dominica on November 4. Manager of The League, Angela Patrick-Bertrand stated that over the month of October, thanks to the support of many, including the North Union Secondary School, they were able to raise a large sum. Therefore, 30 boxes of non-perishable food items, sacks of flour, sugar and bales of toilet paper were loaded onto a truck on November 3, to be shipped the following day from Kingstown, move through St Lucia and finally reach Dominica on November 7. She said from what she has heard since Hurricane Maria, the island is still in need of help and will still be in the future. She stated that the League will be seeking to send intermittent shipments to places affected by the hurricanes Maria and Irma, including Antigua and Barbuda, and this intiative will extend into the new year.